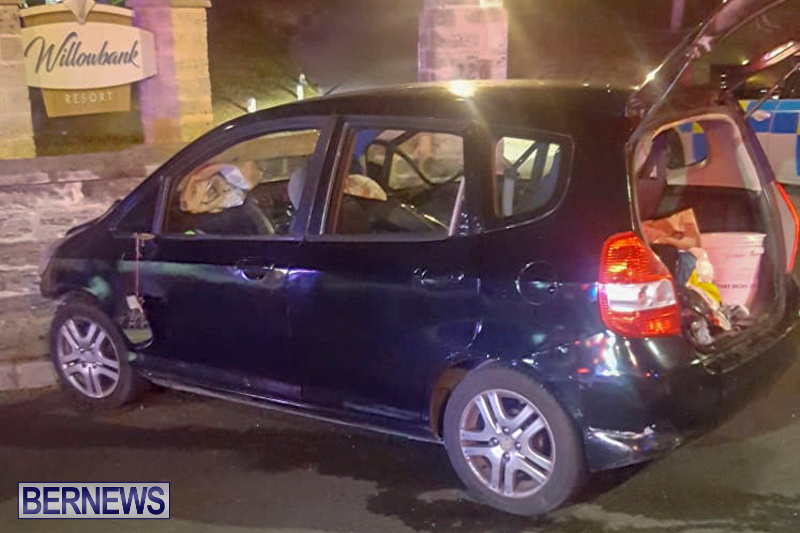 [Updated] Emergency services responded to a collision on Somerset Road early this morning [Aug 25] at the entrance to the Willowbank Resort where a car crashed in to a wall resulting in the driver being injured. 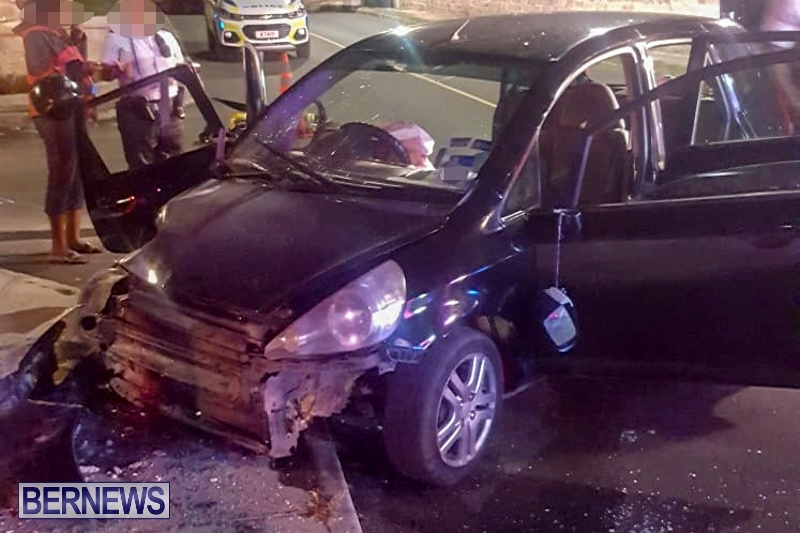 Bermuda Fire and Rescue Service personnel were called on to extricate the driver before he was transported by ambulance to King Edward Memorial Hospital for treatment. Further details are limited at this time, however we will update as able. 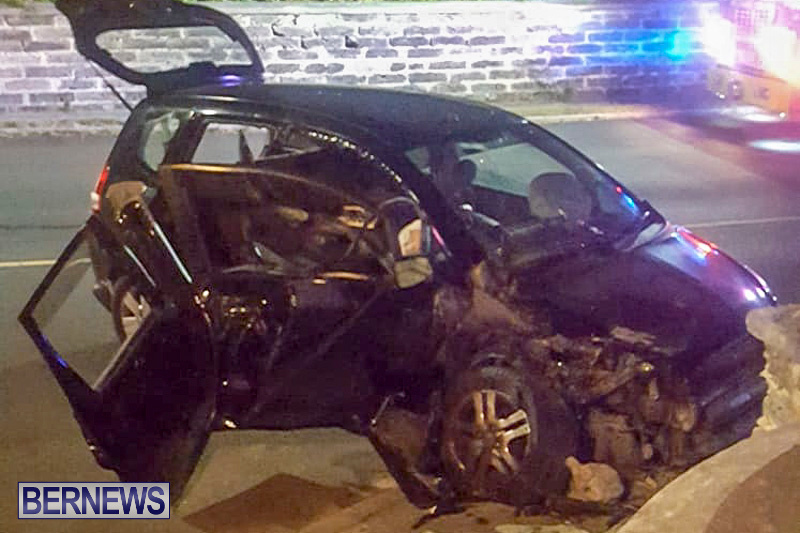 Update 10.00pm, Aug 26: A police spokesperson said, “Around 1:25am Saturday, August 25th police and fellow first responders were dispatched to a reported single vehicle car crash on Somerset Road in Sandys parish near the junction with Wilson Place. 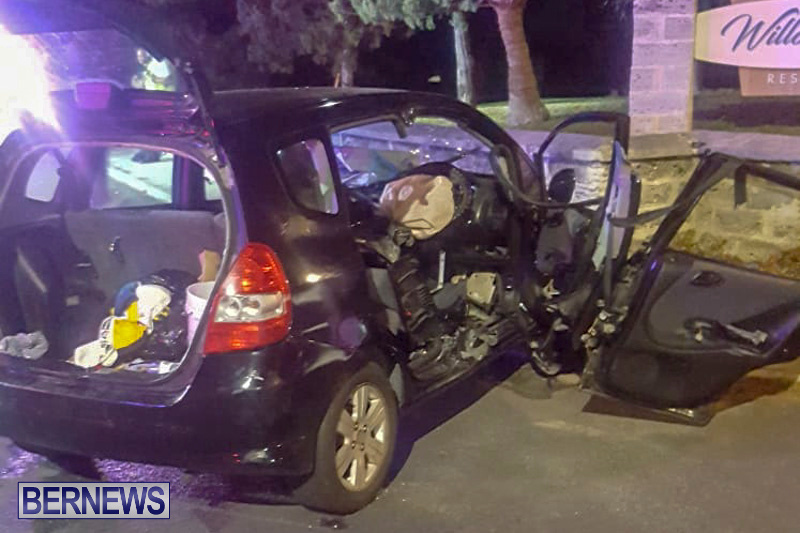 “It appears that the car involved was being driven along Somerset Road in the eastbound lane when it struck and damaged a wall by the entrance to the Willowbank Resort. “The driver, believed to be a 25 year old Southampton man, had to be extricated from the vehicle by Bermuda Fire & Rescue Service personnel. He was then transported to King Edward VII Memorial Hospital via ambulance for treatment of a leg injury. “An update on his medical condition is anticipated in due course. The damaged vehicle was later towed away. Walls are now jumping out. Wow. I hope he’s ok. Prayers. people are smashing up their vehicles everyday. Shutting the gate after the horse has gone ? This morning I heard a whole amada of safety and emergency vehicle on the move with hooter and sirenes blasting going hell for leather presumably to deal with an insodent. I wonder why the need to drive so fast ? as ariving several seconds late or early hardly makes a difference especially using a four wheel vehicle . I respect the fact that timing is every thing when it comes to saving lives however not at the expence of other road users. The other day an E.M.O. truck going hell for leather almost cleaned me out head on. Question does he stop to save me of just keep going. If it is speed is what it takes to saves lives then may be a motor cycle driven by a first responded medic could be the answer with only 2 seconds . You would think the good samaraten who called for hely would indicate the urgency of the matter. Makes me wonder how many potential accidents happen while E.M.O. and others are on their way. If you or a family member is ever in need of ems you be sure to tell them to come at their leisure. go back to school and learn how to spell or at least pretend and use spell checker! Capitalization and punctuation are important too , eh ? A little Bondo & rubbing compound & that should buff right out.